Safety Aspects of Cleaning | Management Plus, Inc. If you have a safety-related comment, picture or story please send it to me and it will be posted on this blog. Many materials used for cleaning have hazardous properties such as the ability to irritate or chemically “burn” skin; be toxic, carcinogenic, or mutagenic, cause degeneration of body organs, such as the liver (many solvents), or lungs (acids, chlorine, ozone); or be flammable or explosive. The Material Safety Data Sheets (MSDSs) for hazardous materials (HazMats) should be readily available because they contain information about the hazards, recommendations for use and storage, and first-aid procedures (where applicable). USA law requires that MSDSs for all chemicals used in the workplace be made available to the workers using those materials. Gases and vapors are often the most hazardous form of materials encountered in the workplace. The hazards may be due to flammability or they may be toxic if inhaled. Generally there is a level, given in parts per million by volume (ppmbv) or weight per volume (mg/m3), below which, the material is not considered hazardous. The Threshold Limit Value (TLV) or Permissible Exposure Limit (PEL) is the concentration of gas or vapor to which an average worker can be exposed on a continuous eight-hour-shift basis, day after day, without suffering ill effects. For example, for isopropyl alcohol the TLV is 400 ppmbv or 980 mg/m3, while for ozone (O3) it is 0.1 ppmbv. Because of the difference in susceptibility of different people to different chemicals, it should be recognized that there should be exceptions to these limits. These values are continually changing so reference should be made to the latest values from OSHA (www.osha.gov). Frequent exposure is measured as a Time-Weighted Average (TWA) value over the term of the exposure. The exposure can exceed the TLV value for some period of time but still keep the average value within the TLV limits. The maximum exposure, under these circumstances is given by the Short-Term Exposure Limits (STEL). For example, the STEL for trichloroethylene (TCE) is 200 ppmbv while the TLV is 50 ppmbv. In some cases there is a ceiling value (“C” limit) or IDLH (Immediately Dangerous to Life or Health) limit to exposure that should not be exceeded at any time. If this value is exceeded, the area should be evacuated immediately. For example, hydrochloric acid (HCl) has a C-value of 5 ppmbv. There are detectors available for measuring the concentration of hazardous gases and vapors and usually they have an adjustable alarm level. Fires are classified as: Class A—ordinary solid combustible material, Class B—combustible fluids such as petroleum product, Class C—involve energized electrical equipment, and Class D—involve combustible and reactive metals such as magnesium. Fire extinguishers appropriate for the class of the fire to be expected should be available. Some materials, such as vinyl, produce toxic vapors when they burn. More people are killed by inhalation of smoke and vapors than are killed by burns. Great care should be exercised in fighting a fire. Each work area should have a list of the chemicals in the area posted on the door. This alerts firefighters to the possibility of toxic fumes or explosive hazards in the area if there is a fire. Flammable liquids, such as alcohol, should be stored in appropriate fireproof containers in limited amounts. Materials not being used should be stored away from the use area in fireproof cabinets that prevent overheating of the containers in the event of a fire. Oxidizing and reducing chemical should not be stored in the same cabinet. Chemical containers should be compatible with the chemical they contain and should be clearly labeled as to their content. Flammable liquids can fuel fires and make extinguishing a fire difficult. The flash point is the temperature at which a liquid or solid will give off enough vapor to form an ignitable mixture with air just above the surface. For example, pure isopropyl alcohol (C3H8O) has a flash point of 12°C, which makes it a very flammable material. The flammable limits give the percent by volume of the material that supports a flame in air. Above or below those limits a flame will not burn by itself. For pure isopropyl alcohol, the flammable limits are 2.3 to 12.7%, while for hydrogen it is 4 to 75%. Acid cleaning can cause the evolution of hydrogen, and acid cleaning should be done in a well-ventilated area with no ignition (spark) source present. Often the plant Fire Marshal will set the limits on the type and amount of a material that can be used based on the flash point of the material. As a general rule, use of large amounts of materials with a flash point of 140°F in an open area would be banned, while the use of large amounts of materials with a flash point of 165°F or higher is all right. The ignition temperature is the temperature at which there will be self-sustained combustion independent of an ignition source. The ignition temperature of a flammable mixture of isopropyl alcohol is 399°C. Use of low-flash-point materials requires the use of good area ventilation or some type of vapor containment. Areas where chemicals are used can vary from poorly ventilated open areas to ventilated “chemical hoods,” to fully enclosed processing volumes. Ventilation of an open area is often the first thing to be considered. For example, trichloroethylene (TCE) is a solvent that is nonflammable but is toxic if inhaled. OSHA health standards allow 50 ppmbv of TCE in the air. This standard can generally be met by appropriate area ventilation. More controlled ventilation can be obtained in a chemical hood that is enclosed except for an opening (face) through which operations are performed in the enclosed work area. Generally this opening may be closed by a sliding window. Air is swept from the outside area, through the face opening, into the work area and out the exhaust. Ventilation is measured by the “face velocity” of the air. A minimum velocity of 100 fpm (feet per minute) is generally used, with higher face velocities used for more toxic materials. In some applications the chemical hood should be fireproof and explosion proof. The exhaust-duct system should be engineered, located, and verified so that the exhaust gases and vapors do not re-enter the building through another ventilation system or pose a threat to people working near the exhaust outlet. Exhaust vents should be clearly marked at the outside location. The best ventilation control can be obtained in a completely enclosed processing chamber(s). This may be a batch-type system where the parts are placed in a chamber, the chamber is sealed before processing begins, and the chamber is evacuated before the chamber is opened to the ambient. 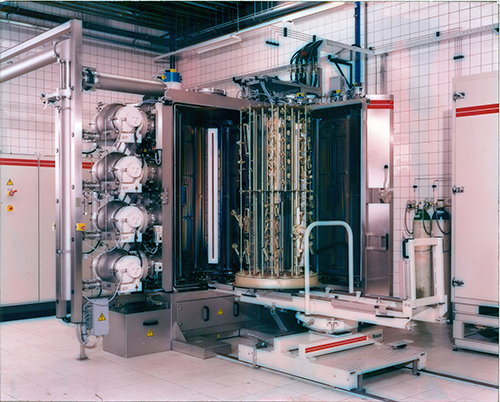 The processing chambers can also be arranged in an air-to-air in-line configuration where parts enter the enclosed processing volume through an entrance chamber and exit through another chamber in a periodic or continuous manner. The inlet and exit chambers may be periodically evacuated or continuously ventilated. A gas “curtain” can also be used to prevent escape or mixing of gases and vapors. Ozone (O3) is used for cleaning (UV/O3 cleaning) and for water purification. Ozone may be generated by short-wavelength ultraviolet radiation (UVC preferably) or by an oxygen-arc or gas-discharge plasma. Exposure to short-wavelength ultraviolet radiation can be harmful to eyes and promote skin cancer. You can smell ozone (it is what you smell after a lightning storm), but above about 10 ppmbv ozone will kill the olfactory nerves and you will cease to smell it. At concentrations above 10 ppmbv, ozone becomes toxic. As long as you can smell the ozone it is safe for short-term exposure. Ozone should be used in a well-ventilated area and when using UV/O3 cleaning cabinets the ultraviolet light should be turned off when ever the operator opens the door of the cabinet. If you must look at short-wavelength ultraviolet radiation you should be well covered with clothing and wear UV-adsorbing safety glasses (a UV 400 rating provides 100% protection from UVA and UVB radiation but not UVC a). a Do not just use regular sunglasses – the dark glasses cause the iris of the eye to open wide and if the sunglasses are not UV absorbing this increases the harm done by the UV exposure. Concentrated acids should be added slowly to water because heat is generated during the dilution. The heating can cause splashing so face shields, goggles, and appropriate clothing and gloves should be worn. Never add water to concentrated acid. Generally one of the main first-aid procedures for any chemical accident is flushing with copious amounts of water. The work area should have an emergency shower facility, an eyewash stand, and/or other sources of water available. Eye rinse cups and solutions should be available. Personnel in the processing area should be trained in basic first aid. This includes cardiopulmonary resuscitation (CPR), stopping blood loss by local pressure, treatment for shock, and first aid relating to specific hazards. It is particularly important that personnel be familiar with in-house and external emergency communication, alarms, and procedures. Hydrofluoric acid is used for etching and cleaning oxide materials and is a particularly egregious material for causing chemical burns. These burns are progressive unless the residual acid is removed or neutralized. First-aid procedure is to immediately remove contaminated clothing, rinse the area with copious amounts of water, and apply a chemical neutralizing agent. Medical assistance should be obtained immediately. The burn area should be soaked in an iced aqueous or alcoholic solution of benzalkonium chloride (USP 0.1 to 0.133%) for 1 to 4 hours. Soaking may be accomplished using an immersion bath or by a wet compress. Hydrofluoric acid should not be used without appropriate first-aid chemicals available and personnel trained in their use. Proper clothing for the workplace is important to safety. Eyes and face should be protected from liquids and flying objects by safety glasses, safety goggles, and/or face shields where appropriate. Goggles, and to a lesser extent safety glasses and face shields, also prevent a person from inadvertently rubbing their eyes with contaminated fingers or gloves. Street clothing should be covered by a lightweight coat (smock) that contains loose clothing, such as neckties, and prevents chemical spills from reaching adsorbent materials such as cotton or silk. The smock can be made of an impermeable material such as Tyvek™, a closely woven fabric such as Nylon™, or a breathable material such as GoreTex™. Cotton is not recommended because it is very adsorbing. When using acids, rubber-coated fabric may be used for smocks or aprons. When handling chemicals, hands can be protected by gloves— polyethylene or vinyl gloves being the most commonly used. When handling acids, rubber gloves are appropriate. When handling hot surfaces, Nomex™ polyamide gloves are a substitute for the asbestos gloves widely used in the past. Nylon™ and Dacron™ are not good materials to wear in a hot environment because they can melt, adhere to the skin, and cause very severe burns. Shoes should be such that chemicals and liquids are not trapped in the shoes if they are spilled. This may mean using high-topped shoes or shoe covers with top closures. Removal of some types of film deposits from PVD deposition chambers and fixtures can present safety hazards. In particular, heavy metals such as lead, or particles of beryllium, tellurium or selenium can pose a health hazard if ingested. It is best to remove these materials by wet techniques to avoid dust. Refer to Sax’s book for specific safety hazards associated with materials. Often grit blasting is used to strip film buildup from surfaces. If silica sand is used the workers should avoid breathing the dust because it can cause silicosis, a lung disease. Silica sand should be washed and used in a well-ventilated area with workers protected by appropriate respiratory equipment. This potential health hazard can be avoided by using cast-iron grit or alumina grit instead of silica grit. Sax’s Dangerous Properties of Industrial Materials, 10th edition, Richard J. Lewis, and N. Irving, John Wiley and Sons, 1999. Hazardous Chemicals Desk Reference, 4th edition, Richard J. Lewis, John Wiley and Sons, 1996. CRC Handbook of Laboratory Safety, A.K. Furr, 5th edition, CRC Press, 2000. Safe Storage of Laboratory Chemicals, 2nd edition, edited by David A. Pipitone, John Wiley and Sons, 1991. Code Compliance for Advanced Technology Facilities: A Comprehensive Guide for Semiconductor and Other Hazardous Occupancies, William R. Acorn, William Andrew Publishing/Noyes Publications, 1993. Quick Selection Guide to Chemical Protective Clothing, 3rd edition, Krister Forsberg and S.Z. Mansdorf, John Wiley and Sons, 1997. This entry was posted in Uncategorized on September 14, 2018 by admin_29823.